President Putin is set to join the festivities in the Russian region of Tatarstan, to mark the millennium of its capital city, Kazan. He will chair a Commonwealth of Independent States (CIS) summit in the city, and is expected to set out a new policy towards the ex-Soviet republics. But for the leadership of Tatarstan, the summit is more of an opportunity to showcase their republic. It has managed to peacefully secure unprecedented autonomy from Moscow. Located some 850km (528 miles) east of Moscow on the Volga river, Tatarstan is also home to a thriving economy. When President Putin arrives in Kazan, he will see the results of one of Russia's biggest urban regeneration projects. As part of the millennium celebrations the historical centre of Kazan, including its Kremlin, has been rebuilt. A new bridge, and Russia's newest metro system, have been completed and opened on time. Tatarstan, home to almost four million people, has significant oil reserves as well as developed agriculture and heavy industry. Its leader, Mintimer Shaimiyev, has secured autonomy without provoking Moscow into intervention with demands for independence. The region has a strong sense of ethnic identity and appreciation of its unique history. Its main people - the Tatars - trace their origins back to a Turkic people, the Volga Bulgars, who built a prosperous and powerful state in the 10th century. Some 300 years later, it was annexed by the Mongols of the Golden Horde. Then, as the Golden Horde itself collapsed, a separate Kazan Khanate seceded, only to be annexed by Russia in the middle of the 16th century. Islam remains important in public life. 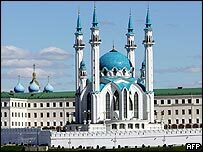 Kazan is home to an Islamic university and Europe's largest mosque, which was opened earlier this year. Against this backdrop, Vladimir Putin will chair what is being touted as a make-or-break summit of the CIS. Russia's foreign minister, Sergei Lavrov, said earlier this week that the summit must refocus the CIS towards a social and humanitarian agenda. It is a frank acknowledgement that the CIS no longer allows Moscow to maintain economic, military or even political influence in the former Soviet republics.